I’ve talked in the past about how one of our colonies is super aggressive. 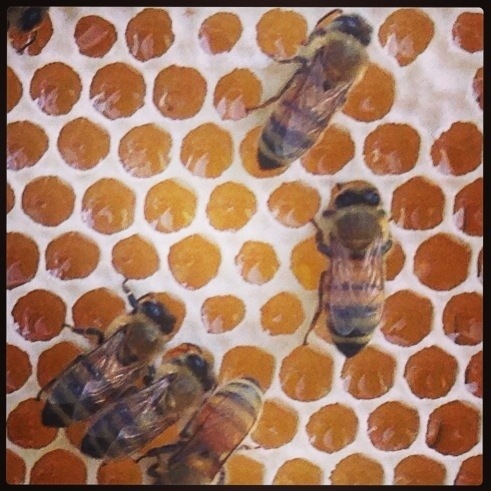 And the colony isn’t even as productive in drawing out comb and producing honey as our other colony. 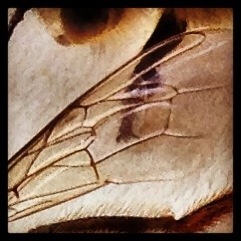 It is very productive at stinging. him: They follow you when you walk away? me: Exactly! Any advice on how to handle them? him: Sounds like you need to requeen. You’ve got a queen that is making angry bees. You need to find the queen, twist her head off, throw her body in the bottom of the hive, and in 24 hours, replace the queen with a new one. At this point, I am thinking to myself, “Wow, I could use this as a metaphor for so many situations. “You need to requeen…your queen is creating some angry employees” just as an example. I told him that I would try, but I have never been able to find the queen. I have just gone by the fact that there are eggs, larva, and emerging bees to assure me that the queen is safe and happy. Her actual being I have never seen. Matt and I suited up that evening and visited the hives. I tasted some and it is excellent. 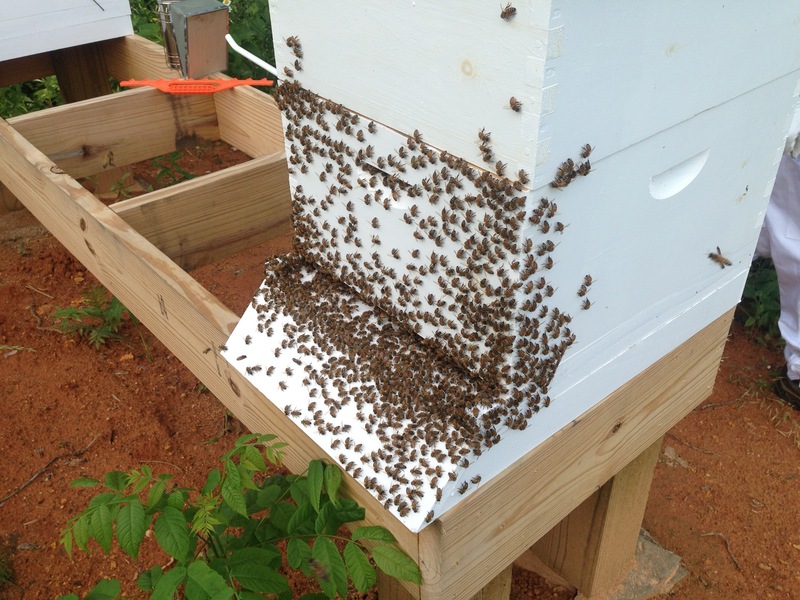 This colony is so productive that we might actually get a little honey from this hive this year! 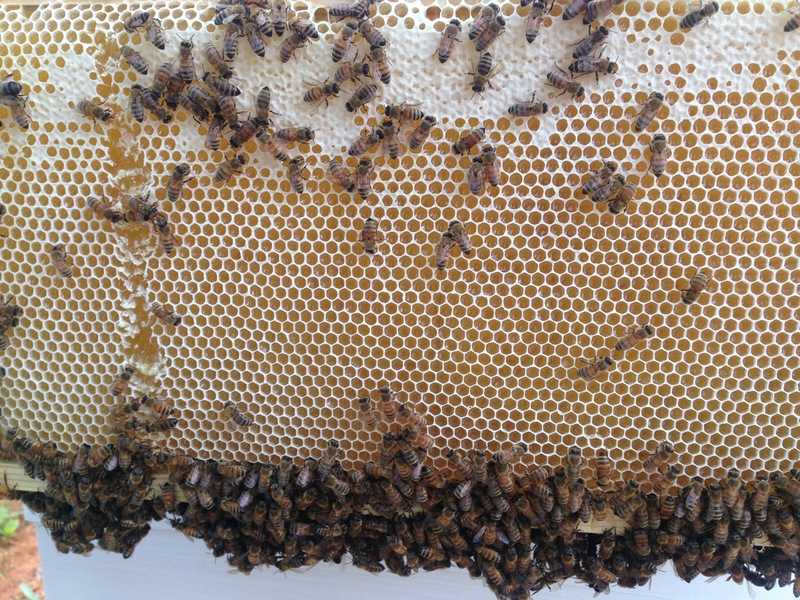 After the quick check on our star hive, we opened our Fight Club hive. They came out swinging. 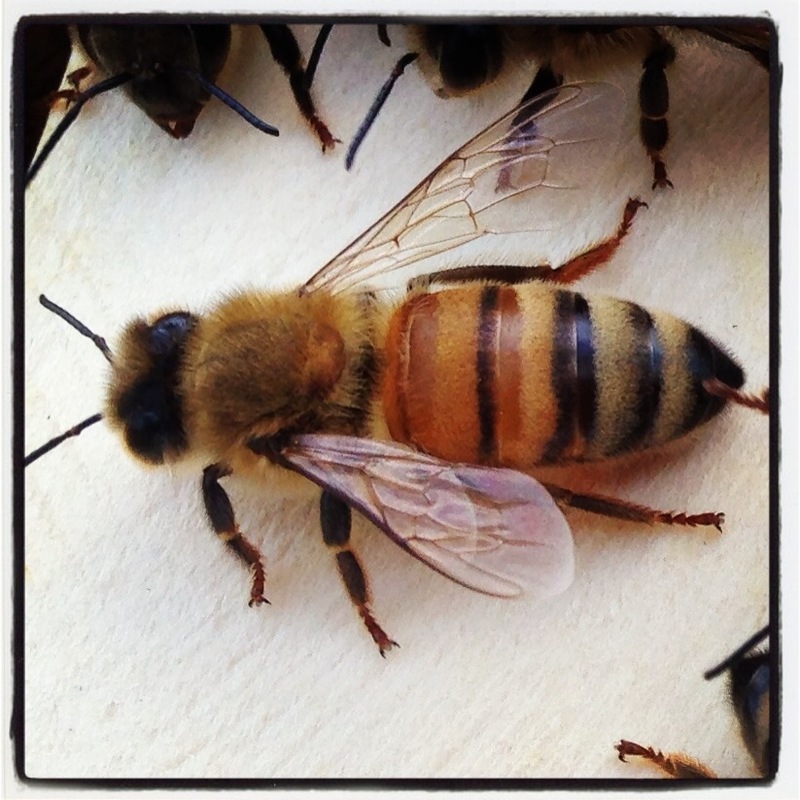 We looked and looked and cowered from the onslaught of bees, but could never find the queen. They were very mad at us. And let us know it by continuing to attack our hats long after we closed the hive and walked away. That queen really is making angry bees. We hope to have the other beekeeper come by and help us find the queen; otherwise, I’m letting that colony live and let live. 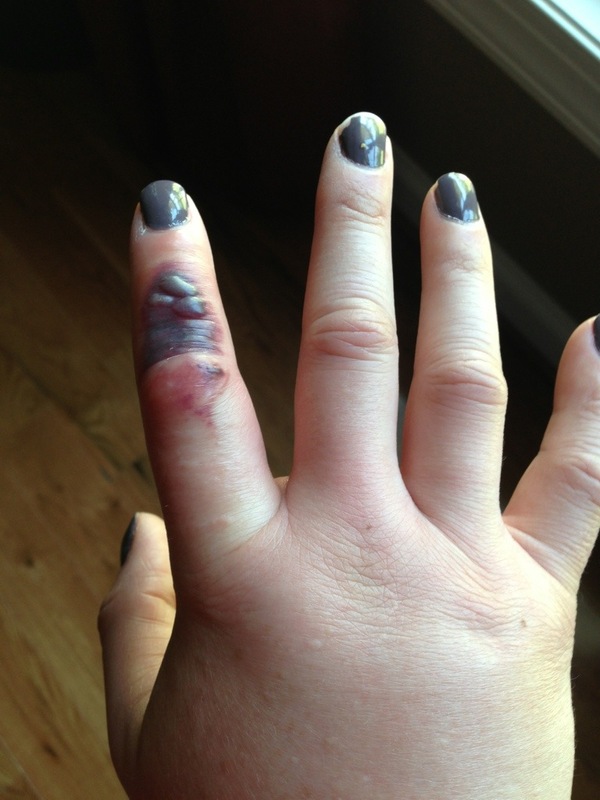 I am having a large, local reaction (according to WebMD) to the bee sting in my index finger I got yesterday. I took my glove off for about 10 seconds, and a bee dive bombed me and stung me around my knuckle. I have noticed that one colony is definitely more aggressive than the other. In beekeeping class, the more experienced bee keepers talked about that colonies could have totally different personalities and our two are very different. Anyway, one of the bees from the aggressive colony got me good yesterday, and several hours after the sting, my finger and hand started to swell. Today, I also have the bruising and blistering. It looks like the beginning of a flesh eating disease attack. Anyone else have reactions like this? I’m treating with ice, ibuprofen and antihistamine. Anything else? This was a story on NPR on Friday, March 1. Interesting theory that “kept” bees can’t be as efficient at pollinating the crops without the help of local feral bees. The link will take you to NPR’s website where you can actually listen to the broadcast. Wild bees….play a key role in boosting crop yields. Farmers who grow these crops often rely on honeybees to do the job. But scientists are now reporting that honeybees, while convenient, are not necessarily the best pollinators. A huge collaboration of bee researchers, from more than a dozen countries, looked at how pollination happens in dozens of different crops, including strawberries, coffee, buckwheat, cherries and watermelons. As they report in the journal Science, even when beekeepers installed plenty of hives in a field, yields usually got a boost when wild, native insects, such as bumblebees or carpenter bees, also showed up. Unfortunately, a second study, also released in Science this week, makes it clear that wild bees aren’t having an easy time of it. That study essentially follows in the century-old footsteps of Charles Robertson, “one of America’s great scientists that nobody knows about,” says Laura Burkle, an ecologist at Montana State University. Robertson taught biology and Greek at Blackburn College in Carlinville, Ill., and he was fascinated by the close connection between insects and flowers. He spent years in the forests around Carlinville, carefully noting which insects visited which wild flowers at what time of year. Burkle and Tiffany Knight, a colleague at Washington University in St. Louis, went back to Carlinville to see how much of the ecosystem that Robertson observed still exists today. Much of the forested area around the town has been converted into fields of corn and soybeans — or suburbs. In the fragments of forest that remain, Burkle and Knight found all of the flowering plants that Robertson recorded in his notes a century ago. Of the 109 species of bees that Robertson saw, though, just over half seemed to have disappeared from that area. “We don’t know why,” says Burkle. One possibility might be a loss of nesting sites for these bees. But a changing climate may also play a role. The bees that disappeared tended to be species that depended on just a few kinds of flowers for food. For those bees to survive, their preferred flowers have to be blooming when the bees start flying and need food. The warming trend might have thrown off that timing. In fact, Burkle says, if you map the interactions between flowers and bees, they seem more tenuous now. Some flowers may get visited by just one or two kinds of bees, and maybe just for one week. “I don’t know that these systems can take a lot more environmental change without something drastic happening,” she says. Many bee researchers are trying to figure out how to help those native bees — and how to help farmers who benefit from them. Claire Kremen, a conservation biologist at the University of California, Berkeley, who’s a co-author of the first study in Science, says one of the biggest problems for wild bees is the agricultural specialization that has produced huge fields of just one crop. The almond groves of California, for example, are a sea of blossoms in February. It’s a feast, as far as the eye can see, for honeybees that come here from all over the country. “But for the rest of the year, there’s nothing blooming,” she says. That means there are no bees. “In fact, in places where we have very large monocultures of almond, we don’t find any native bees anymore,” Kremen says. Planting other flowers in and around these almond groves, maybe as hedgerows, blooming all summer long, would help, she says. Even better would be farms with smaller fields, and lots of different crops flowering at different times. Wild bees, Kremen says, need diversity.